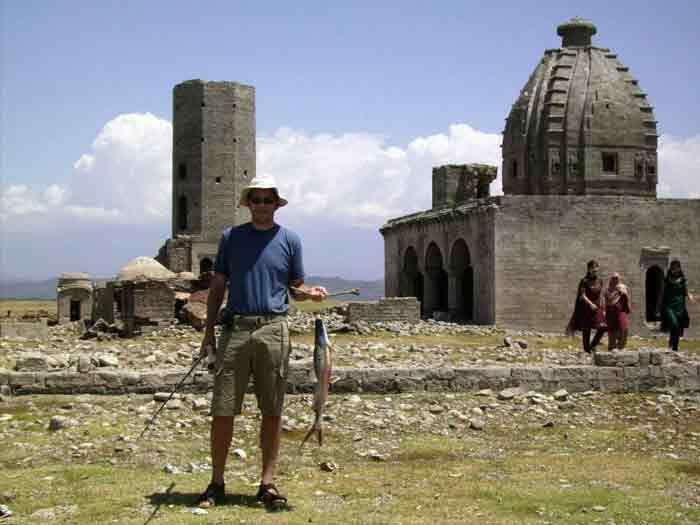 A brief account of a fourteen day fishing trip that I arranged with a group of friends, Grace, Simon, Dave and Attul in this little known part of Himachal Pradesh, Northern India. Arrived at Basunti at 11am to be greeted by Dave, who lives in this beautiful place, and a much needed cold drink. We have only been chatting for about ten minutes when Attul – an old hand at fishing in Himachal Pradesh – appears on the veranda carrying five Golden Mahseer. Fantastic, just what I was I was hoping for, the fact he had returned another eight was even better. Dave and I were now full of anticipation and could not wait to get down to the water for the evening session. Time to check the gear and have some lunch, then chill by the pool until the temperature drops to a comfortable level. the surface before hitting them from below. We fish for about two hours with no success and realize that we are going to have to make more of the morning session, after the fishermen bring the nets in. A delicious dinner on the veranda of baked Mahseer, local brown rice and vegetables, with salad from the garden, more than compensates for the lack of afternoon action. 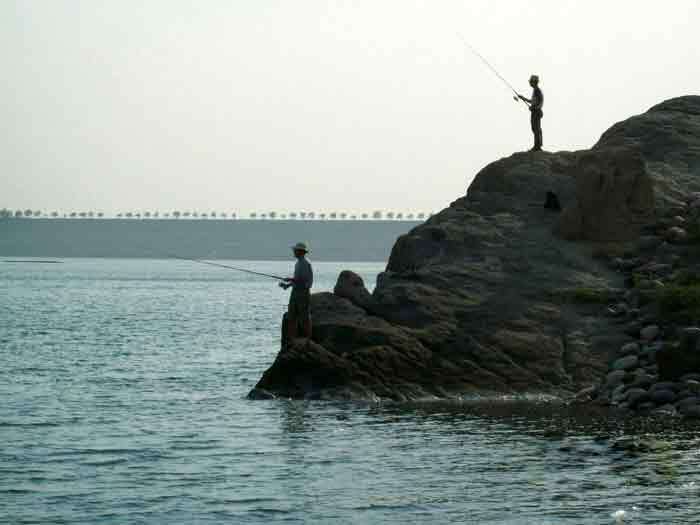 We decide to fish Tern Bay, a shallow area with a beach made up of large pebbles and a sheer cliff to the left. 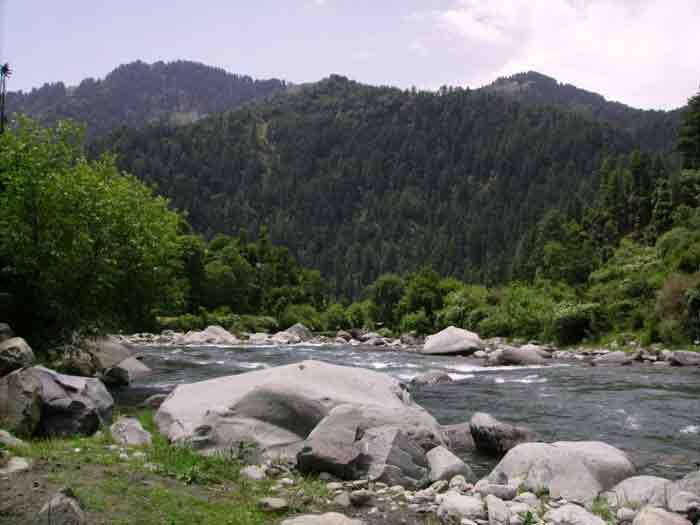 This creates a natural corral and is a perfect place for Mahseer to ambush the small fry (Charl) they normally feed on. After a few good slugs of South Indian coffee we leave Basunti at about 6am and walk for thirty minutes to the bay. This is a wonderful time of day to fully appreciate the beauty of this place, wild Jungle Fowl calling in the forest, the sun slowly creeping over the Himalayas and the occasional plop of a large fish breaking the water. The fish are feeding well when we arrive and straight away Dave hooks into a good fish. After two or three long runs everything goes slack. A fish lost in the first 10 minutes, surely the first Mahseer of this trip is not far away. How wrong could we be, the commotion made by the lost fish has driven the rest further out into the lake. We fish on for an hour without a touch, watching the fish feeding a good 50 meters out of our reach. Heat now getting the better of us we decide to head back to Basunti, fishing and walking, taking a couple of nice freshwater Garfish on the way. Simon and Grace arrive just as we are leaving to fish, they decide to take a dip in the pool instead (oh fishing is tough in India). This time we head for the gullies so as to keep away from the nets in the open water. The target fish this afternoon is Sol and Singhara. The Sol bask in the shallower areas of the gullies, maximizing the last bit of warmth before the sun goes down, while the Singhara hugs close to the bottom in the deeper pools. I catch the first fish of the day, a nice Singhara of 1.5 kilos a lovely addition to the evening menu. Dave hooks a decent fish but loses it quite quickly in a deep gully, a lot of which have sunken trees at the bottom. We walk back in the light of another beautiful Indian sunset, our senses full of the sights and sounds of the jungle around us. Simon and Grace join me this morning and over breakfast we decide to fish Beachy Point. Dave has some bread to bake and some gardening to do so decides not to join the days fishing. Beachy Point is the entrance to one of the main inlets and is quite deep, usually a good holding area for big fish. Simon starts to fish the inlet mouth in the deeper water and I try the fly for the first time, casting to fish feeding in the bay. 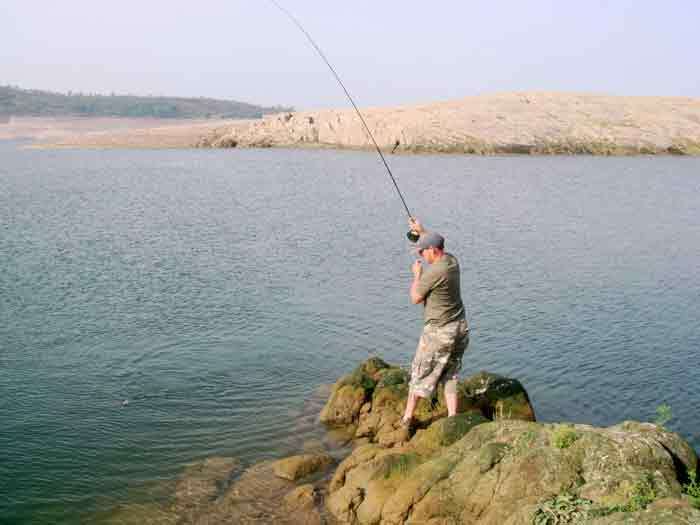 Three casts and Simon hooks a good fish, which makes two long runs into the deep water. 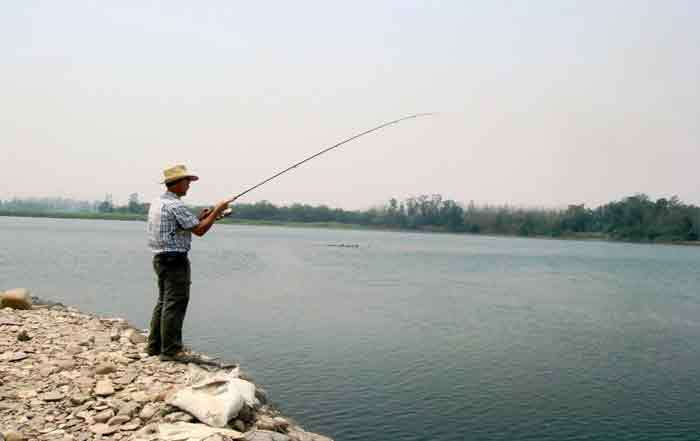 It is essential to have a lot of backing when fishing for Mahseer as even the smaller ones can take a lot of line. Eventually the fish begins to tire and a beautiful Golden Mahseer of 2.6 kilos is beached. 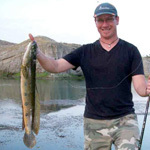 Simon is over the moon, three casts into the trip and he has a personal best Mahseer. This is quickly followed by another smaller fish, which he returns. 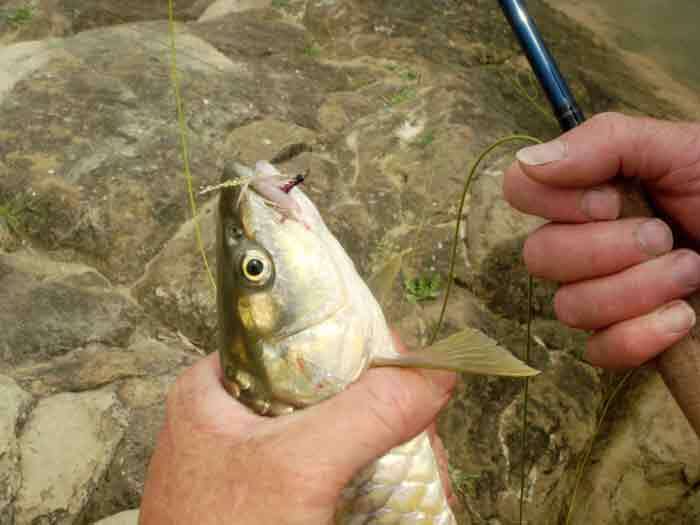 I am smashed twice on the fly, but before the fish spook I quickly change to a spinner and land a 1.2 kilo Mahseer. We stop to watch a Fish Eagle show us how it should be done before heading back for lunch. The wonderful smell of freshly baked bread greets us as we arrive at Basunti. With Grace by the pool and Dave gardening Simon and I decide to set our sights on a big Sol. We head for an area full of large weed patches, difficult to fish, but an excellent area for this amazing fish. The average Sol can be anything from 1-10 kilos but they have been known to reach up to 25 kilos. They are an extremely hard fighting fish and very easily spooked, making them difficult to catch. We started by fishing the deeper sections of gulley, Simon using an imitation frog and myself a number 3 Mepps, With no signs of any fish we move up into the shallower water, where the fishing is trickier as you have a lot more weed to contend with. We drop down to a size 2 Mepps, which will enable us to fish these areas a little slower. Straight away we spook a big Sol basking just below us on a ledge, we estimate it to be about 5 or 6 kilos. Decide to sit back for a few minutes to allow the water to settle and watch for signs of other fish. After a few minutes I see the tell tale signs, a large amount of small bubbles between two areas of weed. I make my first cast from where we are sitting, almost 10 meters back from the water. Within seconds a big Sol hits my lure and makes a 30 meter run, cutting straight though the weed, before heading straight back at me. I try to recover line as fast as I can but the fish is now making a second run and as I make contact again we part company. I am left excited and shaking, the power of these fish is incredible. Once they run they are almost impossible to get back under control, as we have found out on many occasions since. We have more stories of Sol lost than landed, not a fish to be taken lightly. An hour and a half drive gets us to Uchi Bassi in the Punjab. This is where the canal fed overflow from Pong Dam (Maharana Pratap Sagar) is diverted back into the river Beas. 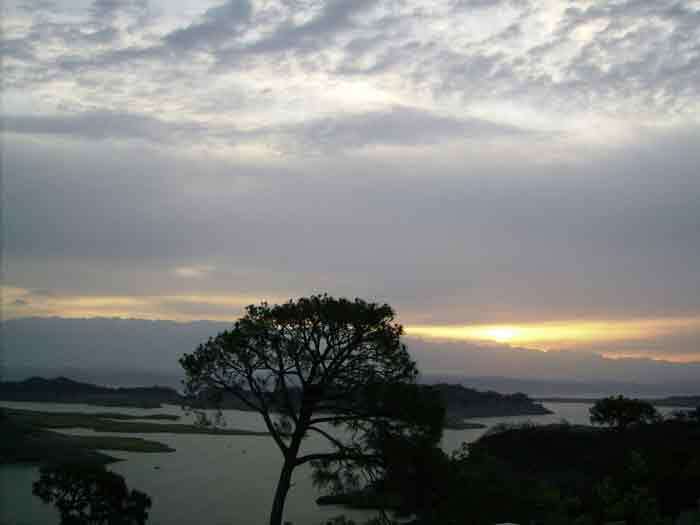 Thousands of small fish called Gid congregate at this entry point, which brings in hundreds of Mahseer to feed on them. The Mahseer range in weight from 2 – 30 kilos and are joined by Shovel Headed Catfish and Goonch, which can grow to well over 50 kilos. Not the prettiest of locations but with a huge potential for hooking some very big fish. Within minutes we have all caught Gid, which due to sheer numbers are very difficult to get through without foul hooking. This is not going to be as easy as we first thought. After two hours of catching nothing but Gid, Dave switches to a silver Toby and lands a lovely Mahseer of 2.2 kilos. We are forced to stop fishing at 1pm when they release the overflow water into the Beas. This causes a feeding frenzy amongst the predator fish and we watch in awe as some real monsters break the water. It is now far too hot to be somewhere with no shelter so we reluctantly head back, already planning our next visit. Staying too long in the sun has taken its toll, so we all take a dip in the pool and relax on the Basunti veranda with a few cold beers. I decide that this is a good time to try tying a few flies. With so little information on fly fishing for Mahseer there are no set designs, so I decide to try a fry pattern, which seems to be the Mahseers main food. Half an hour later and the end result is christened the “Mahsunti” by Grace, it looks great, but will it work? With a change in wind direction we head for the shore opposite the government fisheries building. This area has a good variation of depths, so excellent opportunities to for both fly and spinning. 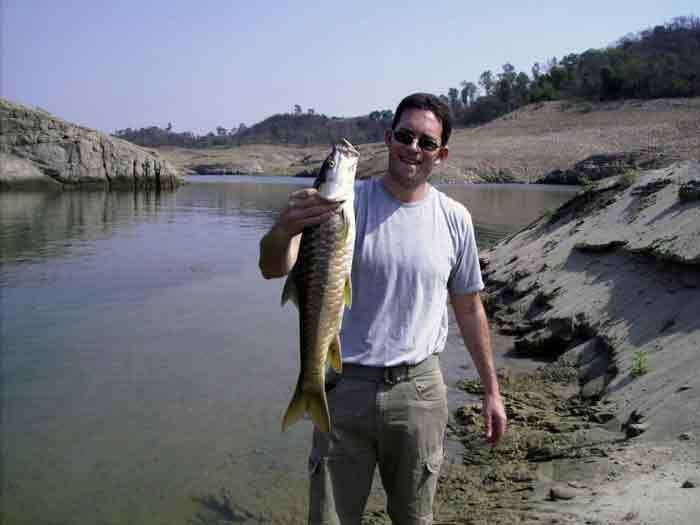 I am the first to catch, landing one Mahseer and losing another in his first three casts, a great start. With no more fish moving in the deep water we decide to move into the shallower bays. Simon, Grace and Dave stay with a spinner while I decide to concentrate on the fly. Almost immediately Dave lands a nice Singhara and then another, both about 1.5 kilos. The feeding fish are now right in front of us I take two on fly and loose another. A fantastic experience, especially as they were all taken on the “Mahsunti”. A Fifteen minute walk to an area where the fishermen moor their boats, a shallow creek good for Sol and Singhara. The fish are moving well, but our plans are cut short as a huge storm blows in from the Punjab. We get back just as the lightening starts and the heavens open. Dave is really happy as this gives much needed water to the gardens at Basunti, which have not seen rain for nearly three months. Big changes in the weather can make fishing unpredictable, we all hope tomorrow will not be affected too much. Our first session after a big storm and we are unsure of how the fish will react to changes in pressure. Decide to fish an area of deep water with protection from 3 sides, known as Crane Bay. I concentrate on the fly while Simon and Dave spin with Mepps and Tobys. Our worries about the previous nights storm are soon put to rest, the fish are feeding well. 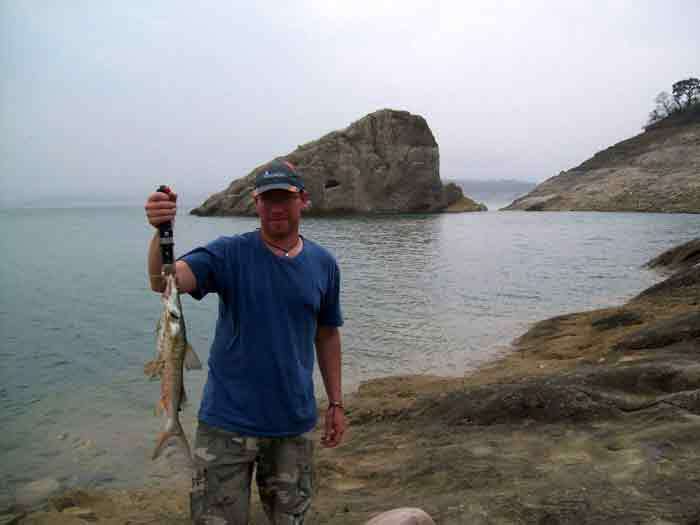 I land two Mahseer, hooking and loosing many others, all taken on the “Mahsunti” fly. Dave takes one, while Simon has four in quick succession. The sport is fast and furious for about an hour and then goes quiet. 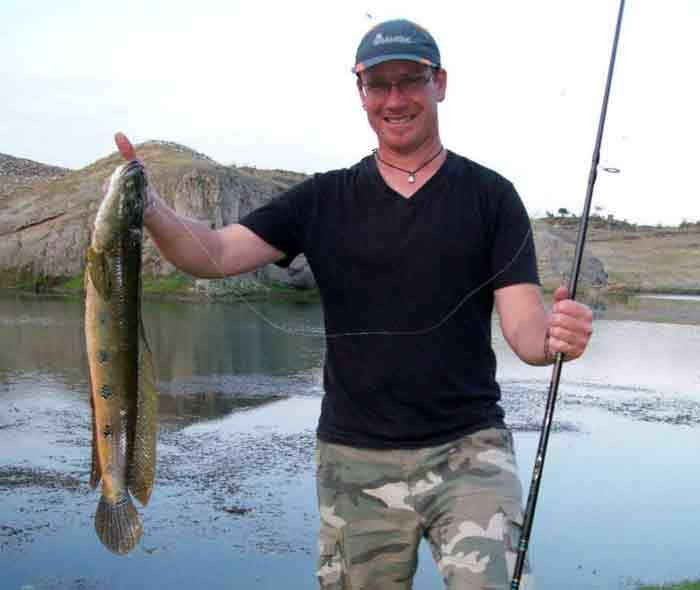 Dave and I finish with a Singhara each, a nice addition to the two Mahseer we have kept, the other fish were returned. I am the only one to leave the pool and cold beers this afternoon, although Dave did head for the kitchens to prepare something exotic for the evening meal. Decide on a quick visit to the many gullies close to Basunti to try for Sol. 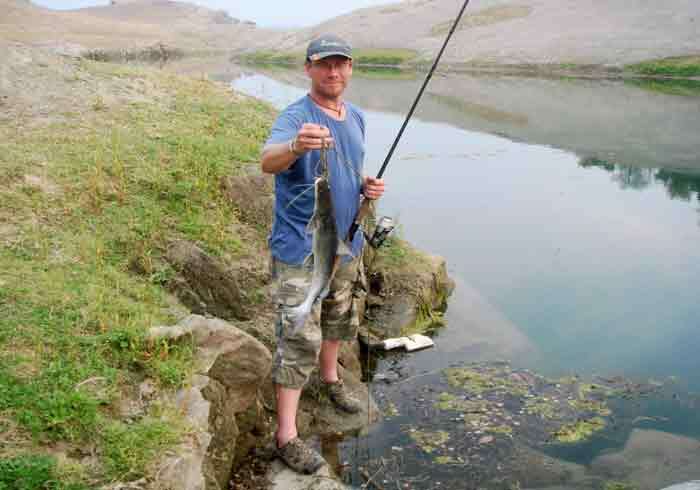 Moving into a small shallow bay I cast between two large weed beds and hook a fish straight away. This time I manage to work it into open water and play it safely to the bank. A lovely Sol of 2.5 kilos, a few photos and it is returned. Up at 4.30 am, a welcome cup of chai and on the road by 5.30. We drive for an hour and a half to the Vhattu Temples. 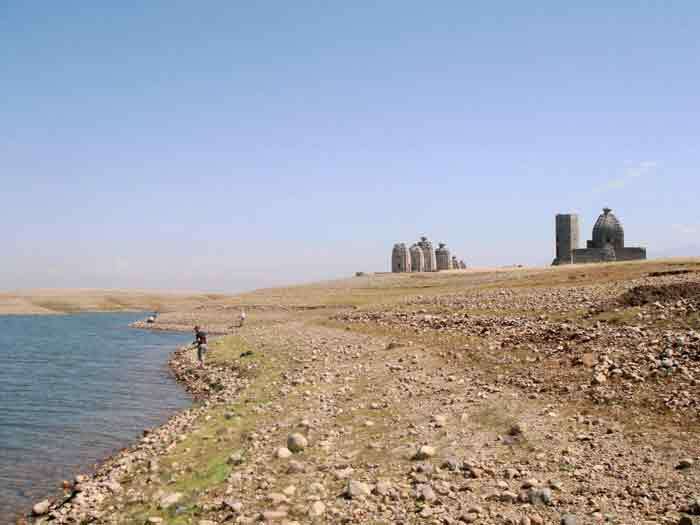 These beautiful eighth century buildings spend nine months of the year submerged and only become accessible in April/May, just before the Monsoon arrives. 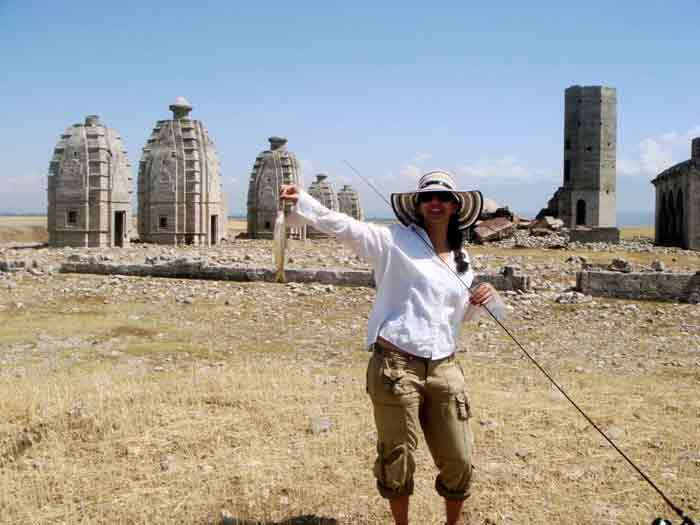 Fishing with these temples and the Himalayas as a backdrop is stunning. Grace catches on her third cast, her first ever Mahseer, she is over the moon and what a magnificent place to catch it. After a couple of hours we have landed 6 small Mahseer. Simon finishes the session with a 2.2 kilo Singhara, the biggest of the trip so far. A short stop at a local Dhabba for cold drinks and excellent samosas completes this memorable morning. Attul drops in briefly and decides to join me in trying to catch some Sol, in the shallow bays opposite the fisheries office. Instead of Sol we find a large shoal of young Mahseer feeding, so gear down to some light tackle and size one Mepps A short fun session finishing of a really enjoyable day. Simon and I decide check out a new area, which is about a forty five minute walk away. 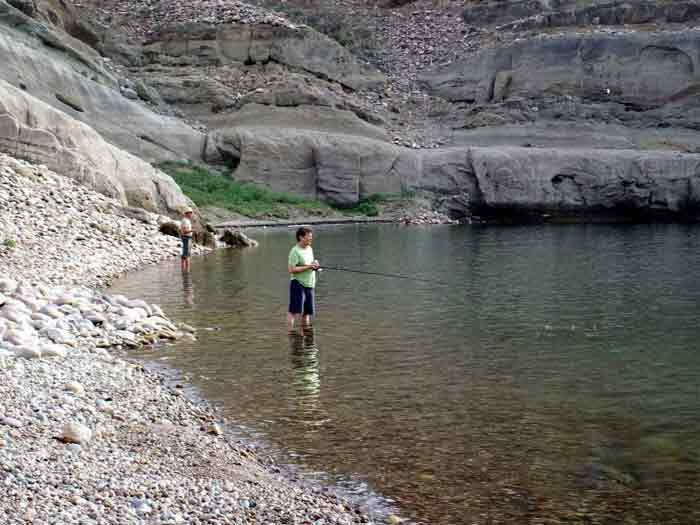 This is not the easiest area to fish as it comprises of some steep cliffs, cut through with small inlets and bays, excellent Sol hunting territory. The first inlet we get to has two Sol, which we estimate to be around 7 – 8 kilos. Simon takes the first cast, a perfect shot just beyond the fish, as the lure hits the water both fish spook and shoot into deeper water. Around the next point we find a shallow bay, with good weed coverage and the tell tale signs of Sol. I creep up slowly and the moment my first cast hits the water a Sol of about five Kilos hits the lure. It runs straight into open water before lodging itself under a branch about thirty meters out. 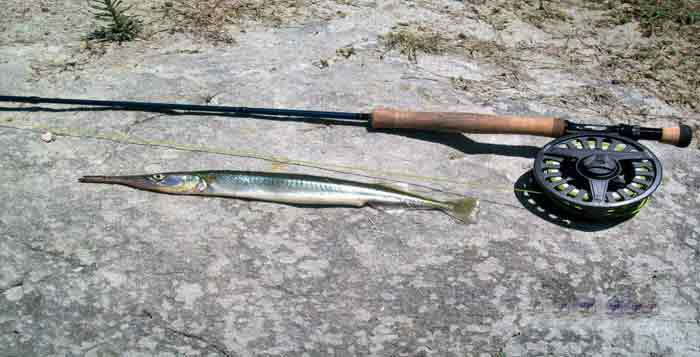 The fish manages to lift the branch before snapping the line, another Sol lost. This fish is steadily becoming our favourite Indian species as it always manages to leave you in awe of its speed and strength. Walking back we see a rarely seen sight, an adult Sol looking after a ball of young. The fish moves slowly with hundreds of babies swimming around its head, we sit quietly and watch until it disappears into deeper water. We all spend the rest of the day chilling on the Basunti veranda, watching the huge array of birds that visit the garden. We leave Basunti to drive to Dharamshala Airport, as Dave is flying to Delhi on his way back to London. This gives us the opportunity to continue on to Barot, which has been highly recommended by Attul as a great place for Trout. After a five hour drive we stop at Palampur and spend the night with Attul. The evening is spent discussing the terrain and conditions we will be facing tomorrow, when we get to our destination. 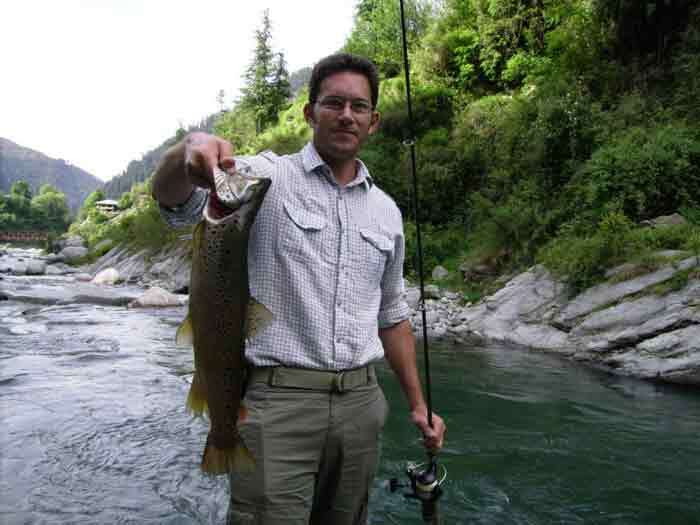 We are going to be fishing two small rivers in the foothills of the Himalayas, the Uhl and the Lumba Dugh. The Uhl is the larger of the two rivers with many good pools and fast stretches. The first three kilometers of this river can be accessed by road with a further four to five by foot, these are virtually untouched. The Lumba Dugh, although smaller, supposedly holds less but much bigger fish. This needs to be fished before 2pm as the glacial melt makes it almost impossible to fish after that time. It is with great anticipation that we look forward to tomorrows fishing. The two hour drive to Barot passes much too quickly. The scenery is truly spectacular, with steep hillsides covered in Deodar Pine and Himalayan Oak and the occasional village making a chequerboard pattern on the slightly flatter areas. 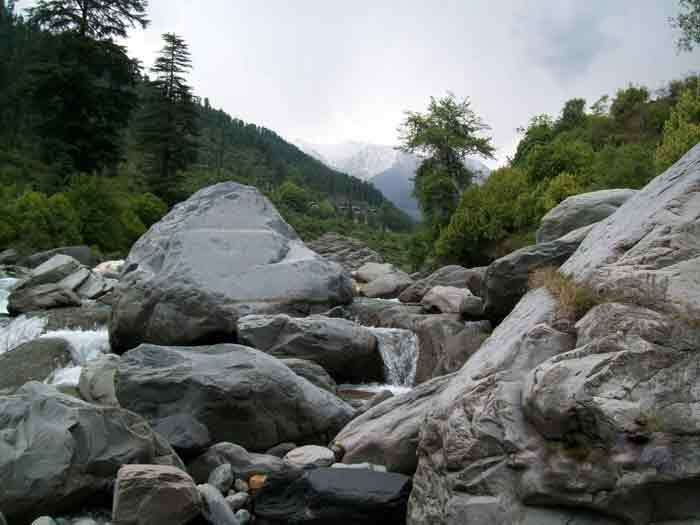 Barot is nestled at the head of the valley where the two rivers meet, with the Himalayas completing this picturesque setting. Our first stop is at the government fisheries office to pick up our licenses before getting settled in to a local Guest House. Close to the Guest House is where the Uhl and the Lumba Dugh join so we decide to test the water at this spot before lunch. Within minutes we are all catching full-finned Rainbows. Grace and Simon take a few on spinner and I manage to catch on both dry fly and nymph. After lunch a five minute drive puts us at the first of many beautiful deep pools on the Uhl. The first of these holds a selection of Rainbows and Browns. As we go higher the Rainbows disappear and we start hooking into some big, hard fighting browns. This is where the fly really came into its own, with weighted shrimps and spider patterns accounting for most of the fish taken. We carried on up the Uhl for 2 hours taking well over 20 trout between us, the average weight about half a kilo. When we reached the end of the road, we decided to call it a day and save the walking section for tomorrow. After an excellent breakfast of paratha, scrambled eggs and copious amounts of chai we set off for the smaller of the two rivers the Lumba Dugh. We fished hard for a good hour, turning a few fish but not connecting with any. As we only had until 2pm before we set off back to Basunti, we all decided that our time would be better spent searching the area beyond the last village on the Uhl. The first pool was a beauty, long and deep with large boulders on the opposite side, perfect holding areas for big Browns. I fished at the head of the pool and left the open water for Grace and Simon. Straight away I had a nice fish of about half a kilo. With the noise of the water and the buzz of catching the first fish of the day, I totally missed the excitement happening further down the pool, Simon had hooked and landed a 2.2 kilo Brown Trout. An amazing fish, Simon had only caught his first ever Trout yesterday and had now taken a personal best that even the hardiest trout angler would have been proud of. We carried on walking up stream for about 2 kilometers, finding pool after pool, again taking a tally of well over 20 fish. 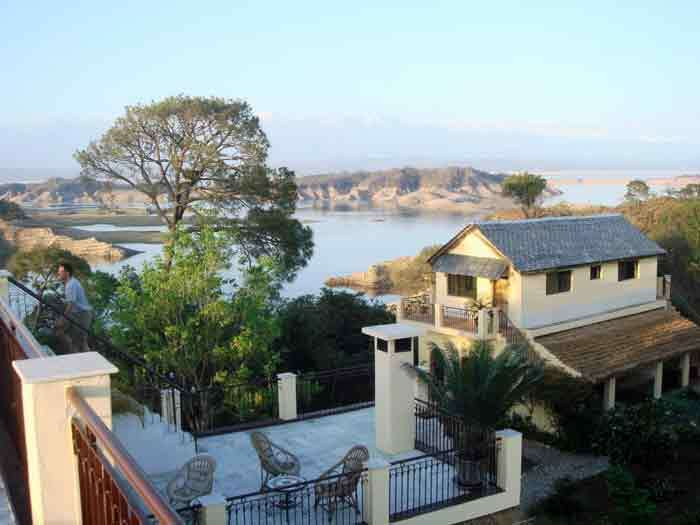 We returned to the Guest House, packed our bags and headed back to Basunti. A five hour drive leaves us with a lot of time to reflect on what a great time we have had over the last eleven days. So many things still to discover and that elusive monster fish lurking in every new pool and bay that we find. Definitely not the last time that I will be visiting this this wild and beautiful part of the world. With many thanks to Kim, for introducing me to India, Dave for Basunti, Attul for his wealth of local knowledge and Grace and Simon for being Grace and Simon.